I planted Incredible corn late May and now the silk is drying out but the corn still looks small and immature. The kernels are sweet but small like baby teeth. Should I leave it on longer. It is now mid August. It's only supposed to take about 83 days for this variety but even with manure for fertilizer and plenty of rain, etc. it is too small. How much longer can I leave it on without it turning starchy? Relax. Let it grow some more. Incredible is a yellow corn. Let it go until the kernels are yellow. The 83 day thing only works in the environment where the corn was developed. Here 85 day corn takes 110 days. Today I will pick my 55-day corn for the first time. It was planted June 1, so that makes 76 days. owalker wrote: I planted Incredible corn late May and now the silk is drying out but the corn still looks small and immature. The kernels are sweet but small like baby teeth. Should I leave it on longer. It is now mid August. It's only supposed to take about 83 days for this variety but even with manure for fertilizer and plenty of rain, etc. it is too small. How much longer can I leave it on without it turning starchy? Also would like to know why after this much time, my pumpkin plants keep flowering but there is no fruit setting. Is it too late to expect a pumpkin to form now? Lots of times, pumpkins put on male flowers first, just to get the bees' attention. Do you have female flowers, too? Whether or not it is too late depends upon your first frost date and the variety of pumpkin. My first frost date is September 22, and I am growing a smallish medium pumpkin known as Sugar Pie. It just began producing two weeks ago, and I think I will squeak under the wire with ripe fruits. I'm not too worried. Last year I started them too early and had harvested almost all of them by the beginning of September. I want to try to get closer to Halloween this year. Mention was made about male flowers on the pumpkin vine...today I say little black bees crawling around in one of the flowers. Basically all the flowers look pretty much the same to me. I don't know what to look for. I thought they were all the same. I don't really know what my frost point is here in the Whitley City KY area....we are zone seven. I did see something about someone planting too early as I did last year. I had three pumpkins way before the 'Halloween and Thanksgiving' part of the fall season and they were spoiling so I cooked the largest one. I tried to start later this year but still don't see a pumpkin growing. What's up with that? Female flowers will have a small fruit right at the base of the flower the male flowers are just that, just a flower off a stem. 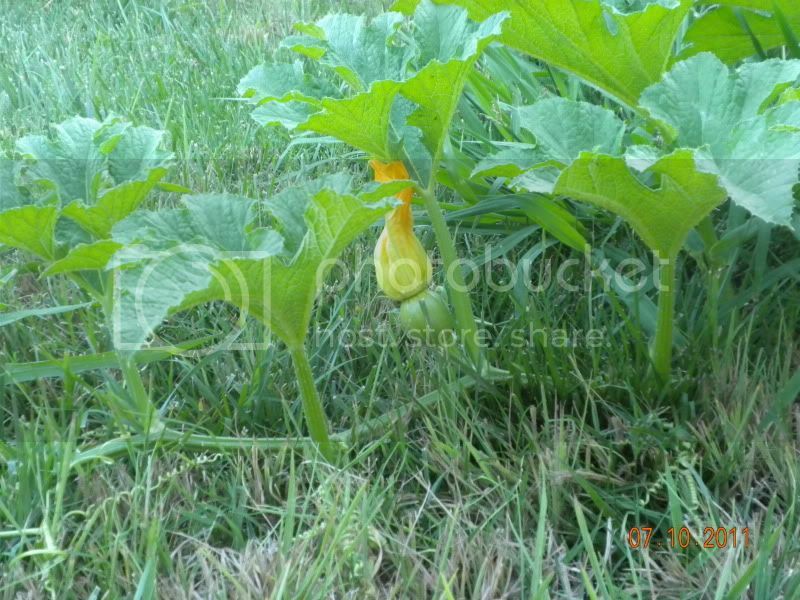 Check out my last post "Happy Pumpkins" there are some pics of very young pumpkins with the female flower still attached. So if you see a little bulb right underneath a flower that's a female and should produce a pumpkin if its pollinated. startiing a garden in timmins -- Short season corn?